Each month thousands of employees move to a new community to start a new job. Moves often are more expensive than anticipated. Not only is there the actual expense of moving but, for a homeowner, there are expenses connected with selling the current home and buying another home. Some corporations may offer to cover some or all of the relocation costs for employees who are moving at the company’s request. Larger companies usually offer a more elaborate relocation package than smaller firms. These benefits become particularly important when there is a large increase in housing costs. When interviewing for a job, or considering a transfer, ask whether or not the company has a relocation program and find out as much about it as possible. Below are listed some of the benefits which may be offered to a relocating employee. Each situation may call for a different bundle of benefits; analyze your own situation carefully. It is always best to negotiate these matters as part of a transfer package, before accepting the new job to avoid surprises to either party after the move has taken place. Cost of a familiarization and house hunting trip for the employee, spouse, and family. Extra time off (with pay) for traveling and house hunting in the new location. 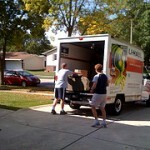 Moving expenses, including packing and insurance. Travel expenses (lodging, meals, gas, etc.) while traveling to the new location. company assumes responsibility for monthly payments, taxes and insurance until the home is sold; price guarantee – if sold by the employee, the company will pay the difference between the net selling price and a specified price; alternative price guarantee - if employee cannot sell the house within a specified period of time, the company will buy it at a specified price; company will pay commissions and other costs of sale. buy down the interest rate; company may offer low or no interest loans. A salary level commensurate with any increase in cost of living between the new location and your old location. How hard should you push for relocation expenses? Try to analyze your bargaining position relative to the prospective employer. Does the employer have many options? Are there many qualified local applicants for the same job? Or do you have unique skills unavailable in the local market?